Your must have jean for the season, this Tory Burch style is adorned with colorful trim that gives it an extra-feminine look. 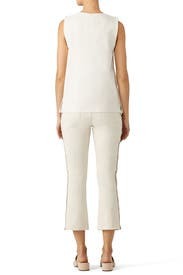 Plus, its cropped flare silhouette makes it a polished, flattering staple. These pants run true to size. We recommend going one size up for backup (see following fit notes for exceptions). Sized: 25-31. Beige stretch denim (98% Cotton, 2% Elastane). Jeans. Front quarter zip with button closure. 5 pockets. Ornately patterned ribbons along the sides. 34” from waist to hemline (9.5" Rise, 24.5" Inseam, 16" Leg Opening). Imported. Beautiful detail & super comfortable. They are stretchy so they were a little baggy. These are definitely different, but in a good one. Great to throw on with a simple top and jewelry so you can let the pants shine. Fit TTS even for someone with curvy hips, because there's some stretch in the fabric. Only deducting a star because there was something about the appliqué that reminded me of clothes I would've worn about 12-15 years ago and I'm not ready to go back to early 2000s trends. These jeans make your booty look like the peach emoji. Very flattering. They're exactly the type of item I love RTR Unlimited for—I'd never buy them for myself, but I wore them five days in a row while I had them. Colors on the side included copper, forest green, ice blue and baby pink. I found that difficult to match, but a white top worked well. Loved fabric but I'm short so the flare at the ankle over accentuated my hips. 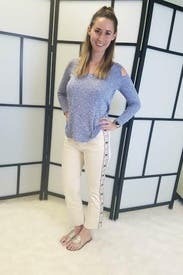 I wore the pants with a solid boho off white top. The detail on the pants really made the whole look! Super cute and comfy. Wore with wedges and flats. Dressed it up with a cute top and also wore with a t-shirt. Super cute embellishments on the sides! Fit perfectly! Got a few compliments! I would never buy, they seem impossible to keep clean, but renting them.. they're great! What fun! An off white jean with trim down the side that made it fun and dressed up the usual jean. Fabric was a heavy denim with plenty of spandex that made it comfortable. I don't like a tight fit, so 29 was comfortable but i could have probably worn a 28. I also like the bootcut bottom since most skinny cut jeans are too tight at the calf. I wore these often and liked them. Details for days and stretchy comfort too! The fit is awesome like right below the belly button and the stretch in the jean was great too! The details are so cute! I really loved my outfit but these are cute with so many different tops and shoes...i just might keep them a while! I got these jeans for a weekend in Austin and they were great! They are really more of an off white or sand color which was perfect for March. The crop length was just right for me at 5’4. I wore the 27s which had enough room in the thigh without a ton of gaping at the waist which is often my problem. They were comfortable to wear all day. The detail on the side is adorable and more noticeable in person than in the photo. The colors in the detail do somewhat limit what tops you can pair with them. I would rent these again. It's too long as a crop pants for petite women and I think only longer legs look good with that vertical stripe down the side. Definitely considering keeping this pair of pants! They are flattering, comfortable, and unique. 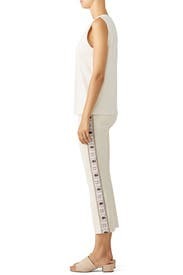 I am 5'3 and they are a true cropped fit. Loved these pants so much! I wore them to work and got so many compliments from men and women. 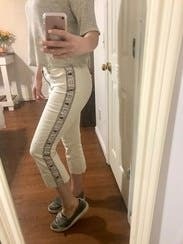 The length was cute for spring and the designs down the side made the white pants so unique. Material was stretchy so ran a little big but can't wait to rent these again! I love these pants SO MUCH!!!! True to size, so flattering (my booty looked FAB) and the detail on the sides is GORGEOUS!!!! Didn't wear. I should have known better than to order these. I'm curvy and a true size 12 and these were too tight. There is also a bit of a weird flare at the bottom. The detail on the side is beautiful and the fabric is nice. They are cream, not white. The side pattern is very unique. Thick denim material. These jeans will look best on women with thin thighs as it makes legs look short and stubby. 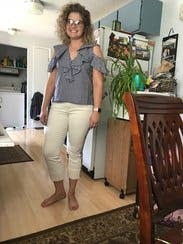 I wore them all day and while initially they felt snug, by the end of the day the jeans were feeling fairly lose and I wondered if I should have had a bigger size. I've never had so many compliments! These pants are really comfortable and the details are beautiful. I wore them to work with wedges and have never gotten so many compliments! The material has a good amount of stretch. Like other Tory Burch pieces, these ran a little large. Could not get them on and I wear a 29 in many other brands. cute pants. just a smidgen too tight. I'm a true 27 and these pants were just a wee bit too tight to be comfortable. will try 1 size up next time. The pants are cute and very stylist. Better for straight hip women. Not so great/flattering for curvy women. Runs small compared to my Anthropology jeans. Did not wear. Cute detail on the legs. The pants flare out at the bottom which looked a bit odd to me. 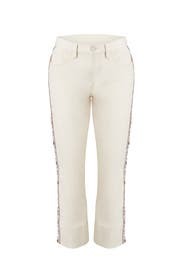 What an amazing pair of jeans from Tory Burch! 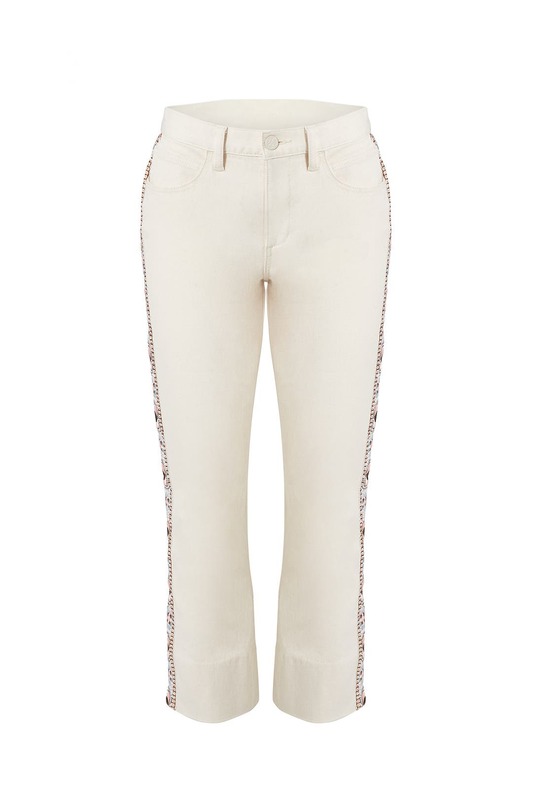 The embroidered and embellished ribbon down the side adds the perfect level of decoration to these jeans. They do run true to size, and they have a bit of stretch for comfort. At 5'5" they fell right at my ankle and were comfortable to wear in the office the entire day. I paired these with gold sandals and jewelry, but with so many colors in the ribbon you have a variety of choices with your accessories! Wear these to a family BBQ and be the envy of every other denim-wearing attendee! My 20 year old daughter said I looked good! fun pants, comfortable stretch and stylish. The fit was ok, I just didn't like these on me. Made my legs look really stumpy! I got these for a couples trip to our friends beach house in Dewey, DE. It was the weekend of Halloween and all the girls in our group kept asking me where I got them. They wanted them, bad. haha! Would rent again in future. Comfy fit. Length was perfect for 5 feet 3 inches tall. These pants are adorable. If anything they may run a tad small, but I'd still get your regular size. Trouble is, they were way too short on me. I'm tall and have long legs and a short body. On the right person they'd be awesome.